It has been a while since I posted a new recipe. 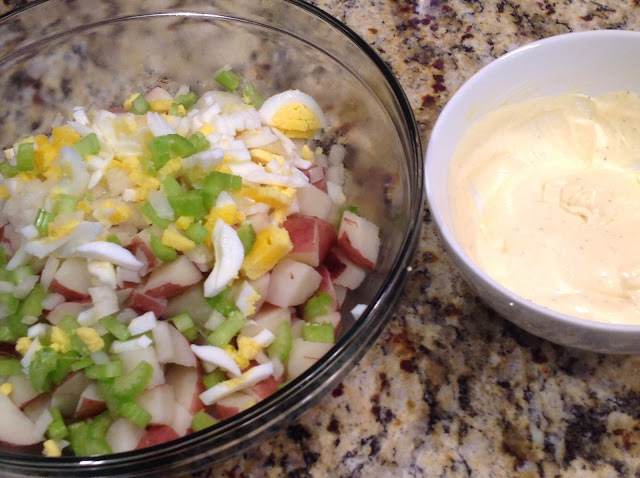 This recipe for potato salad isn't new but an all-time favorite. I've been making it for years and I'm surprised I've never posted it. 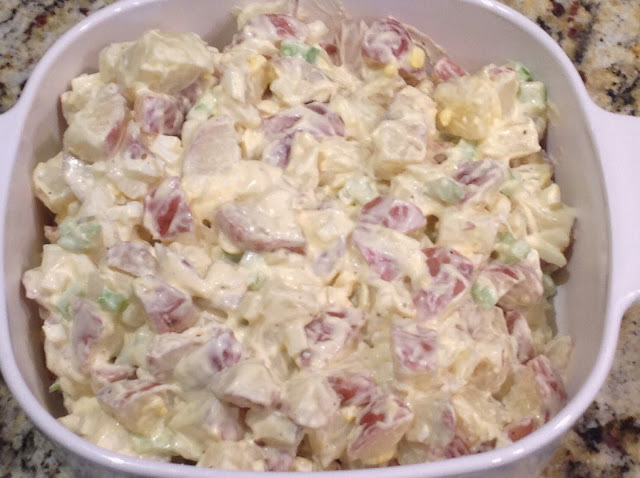 Today we are having a cookout and this potato salad is always requested. It's a basic recipe and turns out perfect every time. 1. Place cut potatoes in a large saucepan; add enough water to cover. Bring to a boil. Reduce heat; cook 10 to 15 minutes or until potatoes are tender. Drain well. 2. Meanwhile, place the egg in a small saucepan; cover with cold water. Bring to a boil. Reduce heat; simmer about 15 minutes. Immediately drain; run cold water over the egg to stop cooking. Peel egg; chop. 3. Place cooked potatoes, chopped eggs, celery and onion in large bowl. 4. In a small bowl, combine mayonnaise, sour cream, mustard, salt, and pepper; blend well. Add dressing to potato mixture; mix gently to coat. Cover; refrigerate at least 1 hours or until serving time.